While selecting wheels and rims for vehicles, the buyers have to consider a variety of factors. The kind of wheel and its attributes play important role in getting the best product. Steel rims and wheels are among the most demanding choice for many vehicle owners. Although, alloy wheels are also considered largely by many, but steel wheels are popular for their durability and strength. Being heavy weighted as compared to alloy wheels and rims, steel rims and wheels offer superior strength in controlling a vehicle. Upon impact, steel wheels are more likely to bend, while alloy wheels are more likely to break, which makes them more desirable for offroad conditions. Having said that, it's much more advisable to equip your vehicle with a set of steel rims now that the colder season is here. You might be facing sludge, salt, debris of ice and snow on the road and steel rims are more capable of handling such challenges than their alloy counterpart. With Tyres Guru it's really easy to find steel wheels and rims, however, you should be aware of the specific properties. You are supposed to know about the parameters like diameter, width etc. The rim diameter specifies an overall size of the steel wheel. You may find a range of diameter from 13 inches to 20 inches. Whether you need steel wheels in 17 inch, 18 inch or any size, you can have a variety of options from leading manufacturers. That should be enough to ensure you can get steel wheels for all common vehicles. What's more, we provide wheel+tyre packages for those who don't want to risk damaging the tyre upon seasonal change. 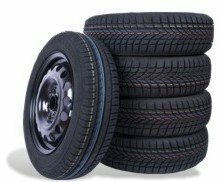 Here at tyres-guru.co.uk, you are served with a wide range of steel rims and wheels. Whatever is your vehicle type, be it an SUV, van, off-roader or passenger car, we offer an amazing collection catering to the needs of that particular vehicle. Selecting your car manufacturer you can have a complete list of available products in your required size. If you gather that we've missed out on some information you believe is crucial, feel free to read through our terms and conditions, or get in touch with our support team.